Ebbo and I have booked our summer holiday... to Copenhagen! Not just the source of vikings, pastries and large dogs, Denmark was also the home to Arne Jacobsen and Verner Panton. 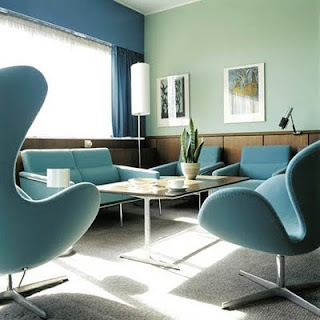 The famous egg chair was designed by Jacobsen for the Royal SAS Hotel in Copenhagen (now called the Radisson Blu). In one of the rooms (Room 606), the hotel has even preserved the original Arne Jacobsen décor from when it opened in July 1960. This hotel was a consideration, but unfortunately my budget was a bigger one. As if the home of Danish modern wasn't enough, we're also going to pop over to Sweden for the day via the Oresund bridge. Scandinavia, here we come! That IS exciting! I hope you have a wonderful trip there when you go, and we will look forward to pictures when you do! !